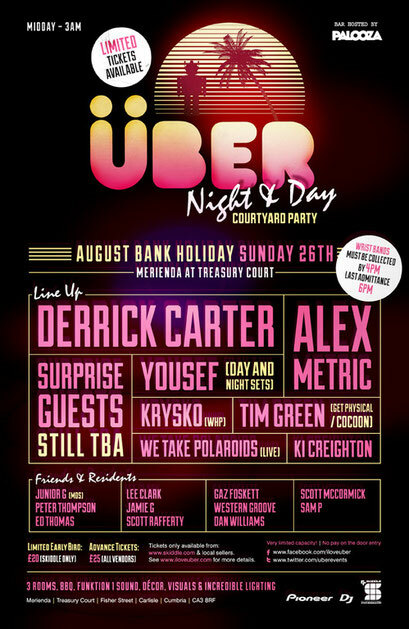 Uber returns to Carlisle, England for its annual August Bank Holiday fun with a brand new venue and a line-up rammed to the rafters with favourites old and new. They will be taking over Treasury Court for a Terrace style event, a venue which has never been utilised in this manner before for an intimate capacity day and night of sun kissed grooves and hedonistic allure. Uber will be joined by local lads Palooza, whose previous guests include Silicone Soul, Hot Creations’ Denny and Nickelle. Headlining is Derrick Carter. When dance music entered its second stage Derrick was leading from the front in Chi-Town, making acid flecked music that looked back beyond the genre’s roots to funk and early disco. There will also be a very special guest joining proceedings - rather likely to share more than a love of house music with Derrick - that w are extremely excited to welcome Glaswegian techno royalty, Slam, to the event! Since the early-90s the duo have been at the forefront of the most interesting developments within house and techno, be it unleashing Daft Punk on the world pre Homework, pushing music over two decades via the influential Soma Recordings or knocking out classics of their own such as ‘Positive Education’ and ‘Lifetimes’. Next up is Alex Metric, whose latest album Ammunition has delivered a bevy of dancefloor slayers ‘Rave Weapon,’ ‘Epichords’ and ‘Anybody Else.’ His flair for the remix has developed into a serious talent in re-imagining vocal tracks, a case in point being the stunning transformation of Dave Gahan’s iconic words on Depeche Mode’s classic ‘Personal Jesus’. 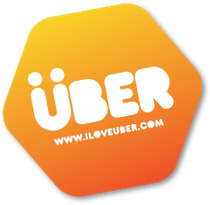 Uber also sees a return from one of its old favourites in Yousef, a DJ who will be playing differing day and night sets. 2012 is shaping up to be a very special year for Yousef, with his sophomore album ‘A Product Of Your Environment’ set to drop side by side with Circus, the club night he has built to become one of the best in Europe, set to celebrate a decade of activity in September.